Fads, they come on strong and eventually fade away (or morph into something else). That's why we call them fads since they really have no staying power. I must admit that I originally thought bubble tea would be a fad that would ultimately lose its luster; however, by combining Taiwanese food with a modest tea shop has seemingly revived the genre. 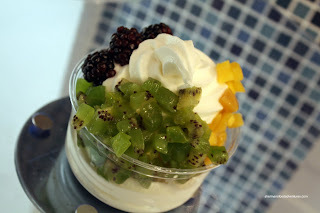 One thing that is gaining popularity is froyo (frozen yogurt). Well, it has already exploded in California some time ago; but we are a bit slow to adapt here. Qoola and Tuttimelon are a few places that come to mind in the GVRD. Blueberry World is another. We had just finished up our meal at CRU and were looking for dessert. Seeing how Blueberry World is only a block away, we decided to try it out. At first, we weren't even sure it was open since it looked deader than NBC's late night lineup. However, upon further inspection, it was indeed open. Viv and I ended up sharing a medium froyo with kiwi, mango and blackberries. First off, the froyo was not all that appetizing. It was icy and lacked any creaminess whatsoever. Not to mention, it was extremely soft, melting very quickly. Furthermore, the toppings were not fresh. The kiwi pieces were translucent-looking and the mango turning a shade of dark that was a bit disturbing. 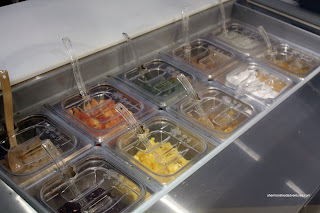 For Viv and I, this had to be the worst froyos we've had in the GVRD so far. Albeit a bit more expensive, Qoola would be a much better choice. I'm not sure if this was an off-day since the one staff member seemed disinterested. However, if this is any indication of their overall product, they're in a lot of trouble when competing with the likes of Qoola, Scoop! and Tuttimelon. - Uh... where are the blueberries??? Unfortunately, I haven't heard good things about Blueberry World either so I have been going to the other ones you mentioned. Now I really don't want to go there. Hey Trisha, I eat Yogun Fruz too... It's not crap. It's just not fresh frozen yogurt which bothers some people. But I still think it's acceptable for the price. I went to Blueberry World when they first opened and even my free sample tasted horrible! Needless to say, I haven't been back! ok got it! Yes I agree it's icier and not as creamy. It melts like water, but I don't mind this texture so maybe that's why...I went to 21 Choices in LA and there's was king of similar...well 21 Choices is untouchable..it's the best ever..but it did melt like water as well. you're fruit looks pretty awful too. Ours weren't that bad.